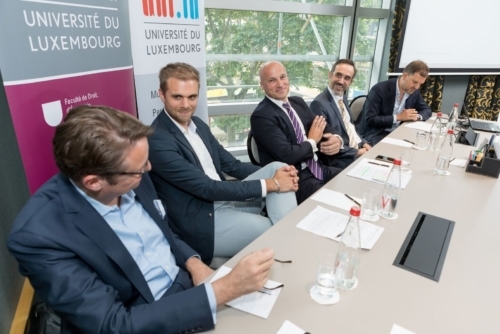 Olivier was honored to be invited by the ABBL and the University of Luxembourg to participate as a speaker at the 3rd Annual Finance & Technology Symposium on the use of data analytics in the financial industry. As there is a lot of excitement in the marketplace around the availability and capability of artificial intelligence technologies, interesting debates took place about data quantity vs. data quality and to what extent such advanced technology can enable the faster/optimal/more efficient access to value-adding information in domains like KYC, AML, Fraud Detection, GDPR, MIFID II, PSD II and more. From left to right Kris Wulteputte (CRO & SVP, State Street Bank International GmbH), Georges Berscheid (CoFounder & CTO, Finologee), Achim Unger (Head of Advisory, Deutsche Bank Wealth Management, Luxembourg), Olivier Merlan (Deputy CEO of idetect), and Mark Boeschen (Manager Magazin).